Summer weddings can be as formal or as casual as you’d like. If you and your fiancé are looking for an alternative to a formal summer wedding menu, then consider adding some fun into the mix. It is easy to add a touch of whimsy to your ceremony and reception with these tips from Cleveland caterers. Get the party started! If your wedding is being hosted outside, consider asking your Akron caterer to offer guests a special pre-ceremony cocktail to set the stage. A fruit-based drink can help quell thirst on a hot day and help your guests feel welcome from the moment they arrive at your site. Explore creative alternatives. Instead of simply thinking along the line of a traditional buffet, think about some creative food alternatives. If you and your fiancé have a love of baseball, then offering miniature hot dogs, popcorn and peanuts during the cocktail hour can lend a personal touch. Eat ethnic. If you come from an ethnic family, then don’t hesitate to incorporate some of your favorite flavors into your menu. From cumin flavored, Latin-inspired rice to collard greens or even artisanal Italian sausage, you can make your wedding reflect your background. Ditch the cake. Not a huge fan of cake? There is no reason to feel obligated to have a traditional wedding cake if it isn’t your favorite. Your wedding reception caterer can offer an ice cream sundae bar, complete with homemade chocolate sauce, decadent caramel sauce and lots of toppings to keep your guests busy. A selection of home-style cookies can finish off your dessert. Have an after party. If you are planning on dancing the night away, or are having your wedding in a location where you can stay all night, consider offering after party snacks. Sliders, chips, hot dogs or pizza are all items that your family and friends will be grateful for after a long day of fun. Your wedding doesn’t have to suspend summer fun. With some tweaks to your menu, you can add touches to your food that will make your guests understand more about the fun you love to have as a couple. By including ethnic touches, having a sundae bar or hosting an after party, you can be sure your wedding food will be memorable. Your Special Occasion – Should You Hire a Caterer? Less Planning – When you hire a wedding caterer in Cleveland, Ohio, you simplify your planning process. An excellent caterer is there to make your day more enjoyable and relaxing. 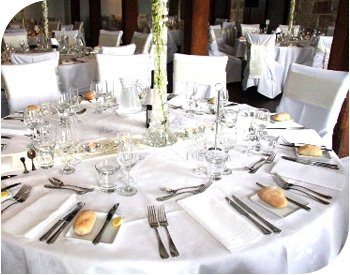 Caterers can supply literally everything from the forks to the tables, food and wait staff. You won’t have to worry about preparing the food, doing the shopping or making sure that everyone gets the meal that they wanted. By hiring an experienced caterer, you can quickly clear several important items off of your “to-do” list. Less Pressure The Day Of The Event – A wedding or critical business luncheon – the type of event doesn’t matter. What does matter is that a caterer can take pressure off of you on that day. If you are a bride, you can spend the day looking and feeling your best rather than worrying about the food. For a business luncheon that could change the course of your organization’s future, the right caterer will give you ample time to network with your guests and give your presentation. Either way, a caterer in Akron, Ohio, can give you the focus you need to enjoy your day. You’ll Be Sure of the Outcome – Potlucks are so unpredictable. Aunt Sarah may have offered to bring the meat, but when she becomes sick, then what do you do? When you hire a caterer, you can be sure of the outcome. You’ll have the food you want, served the way you want, at the time you want – and, more affordably than you think! Food Safety – Food safety is a serious issue at every party. You want your guests to have memories of fun, friends and food, not the fact that half the party ended up becoming ill from macaroni salad that was left out too long. Professional caterers are well acquainted with food safety and contamination issues and will make sure that you and your guests have long-lasting good memories of the party. Special Moments Catering is properly licensed, specially trained and nationally certified in the safe handling of food. Memorable, Theme-Based Meals – For wedding reception catering or BBQ catering in Akron, Ohio, you may want the option of choosing a theme-based meal. Whether French-inspired, a Hawaiian Luau, family-style Italian dinner or elegant cocktails, no one has more options and can do it better than Special Moments Catering. You may be an excellent cook, but on your special day, consider hiring a caterer who can serve you and your guests the meal that you have always wanted. With less pressure and worry for you, having a professional caterer will give you the confidence that your party will have the perfect outcome. You’ll actually be able to “attend” your own party! Any professional wedding caterer should understand that it can be hard to pinpoint the exact number of guests that will be attending the event. RSVPs are received at the last minute, certain guests want to bring dates, other guests have emergencies or other plans that come up short notice – the list of possible factors influencing the final head count just goes on and on. You should confirm the final number of expected guests at least 5 days prior to the big day to make sure that enough food has been ordered. Now, we understand that wedding receptions can become quite costly as the list of guests expands. While no couple wants to be stuck with a bunch of left overs and food because they ordered too much, no couple wants to have a wedding reception without enough food to feed all of their guests. The experts at Special Moments Catering have enough experience to accurately advise you on how much food you’ll need depending on the number of expected guests. For any of your wedding catering and banquet hall needs, call one of the most trusted caterers in the Akron, Ohio area, call Special Moments Catering. Let us make your day one to remember, without the stress. Finding the right caterer for your family reunion, wedding or graduation party can be a real challenge. Making the right decision can either guarantee that you and your guests have an amazing experience, or one that you and your guests would rather forget. Do you have a specialty? If you are looking for a caterer to handle your summer barbeque and you are interviewing a caterer who specializes in vegan cuisine, you may not have found the best fit. Simply put, if you want to have a barbeque, then you need someone who specializes in BBQ catering in Akron, Ohio. What does your price include? Many caterers in Cleveland may give you a price, but it may not include everything that you need for your party. Get an estimate in writing that lists everything that’s included. You should know what your responsibility is from the start. Will you coordinate rentals? For large parties, your site may require tables, chairs and even dishes, glasses and silverware. Ask your caterer if they can coordinate all of those rentals for you as well. It will save you time and frustration during the weeks leading up to the event. Special Moments Catering can coordinate these services. Have you worked the site before? Knowing if your caterer has worked at the site you are considering for other events is a critical question. A caterer who is familiar with the management, layout and facilities will be able to give you a more accurate price and fewer surprises the day of your event. If they haven’t worked at the site before, take the initiative by setting up a time to meet with them and the site management at the site well before the time of your function. Choosing a caterer can be a successful process as long as you approach it as though it is a job interview. In fact, it is! Having a list of questions and getting the answers you need will help you to make a good selection for your wedding reception or business luncheon catering. Eliminate the sit down. – With more and more people focusing on the social side of wedding receptions, the sit down meal is getting the cold shoulder. Wedding caterers in Cleveland, Ohio, are now providing small stations or beautiful buffets where guests can mingle and then move on to visit with other guests and try new treats. The cost is much less and quicker for these styles of service, giving the reception a smooth feel allowing you to spend more time to party! Cupcakes, cupcakes, cupcakes. – No longer just sweet, savory cupcakes are all the rage. Whether a special icing or filling in the center of savory cupcakes are easy to eat while mingling. Caterers in Akron can come up with combinations that are more than just white cake with white frosting. Fresh. – With a new focus on fresh ingredients, Cleveland caterers are now looking to local farmers to provide their artisanal foods for events. Locally grown vegetables and fruits, as well as locally crafted cheeses and salamis offer a taste treat hard to find elsewhere. Talk to your caterer about what is available in your area. More beverage options. – With the trend away from costly sit down dinners, more brides and grooms are opting for a customized bar with lots of options. Complete with a signature drink, guests can enjoy their beverages while nibbling on food, dancing and visiting. 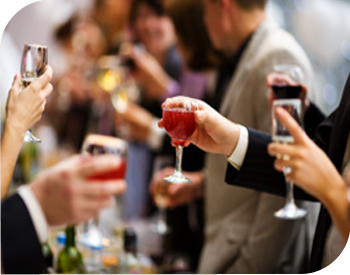 Special Moments Catering can assist in planning your special beverage needs and also. Favorite foods. – Instead of the tried and true chicken dinner, more couples are opting for their favorite foods at their reception. Whether cookies, a delicious pasta station or a sundae bar, incorporating favorite foods can personalize a reception for guests. What do these food trends have in common? You. The best food trends right now are focused on the individual personality of the bride and groom. Whether you opt for savory cupcakes, fresh ingredients or your favorite foods, following these trends in wedding food will help you and your guests to have the day of a lifetime! So you’ve made some headway into the great adventure that’s known as planning a wedding. There’s so little time and so many items to cross off of that never ending “To Do” list. It may seem like more than some soon to be brides can handle. One thing that will surely help to take the stress and strain off of planning and preparing for the big day is to choose your wedding caterer early in the planning process. 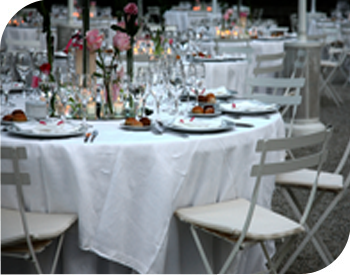 There are a number of reasons why it is beneficial to book your wedding caterer way in advance.